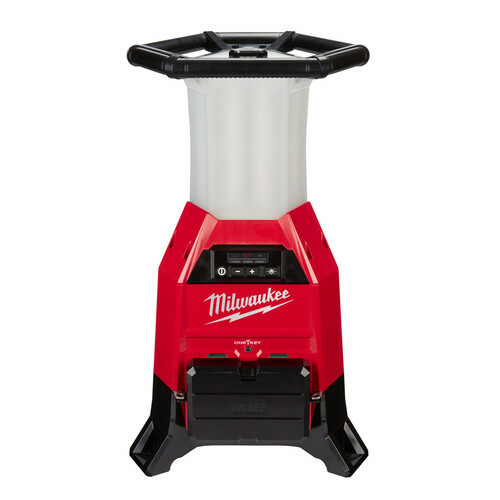 *Add three Milwaukee 2150-20 M18 Radius Site Light and Chargers to your cart and the free item will automatically be added. Limit 2 free items per customer. Offer valid until 11:59pm ET on April 30, 2019 or while supplies last. No adjustments to previous purchases. Subject to change without notice. The NEW M18 RADIUS Site Light/Charger with ONE-KEY sets a new standard for cordless lights. Capable of running off of one or two battery packs, The RADIUS Site/Light Charger with ONE-KEY delivers full workspace coverage with 9,000 lumens for maximum 360° coverage. Adjustable output levels gives the user the ability to light the site for up to 14 hours off of one full discharge. The 2150-20 features an integrated two-bay sequential charger, creating more space on the job site and improving productivity. Additionally, plug-in and daisy-chaining capability allows users to connect up to 6 lights off of a single circuit. ONE-KEY provides users the capability to digitally interact with the light allowing users to CUSTOMIZE light settings, TRACK on or offsite, and MANAGE tool inventories. A unique, stackable design makes the RADIUS Site Light /Charger easy to transport and store in all work spaces. Built to thrive in the toughest conditions, the 2150 features a high impact polycarbonate lens, and IP54 ingress protection against dust and water. Consistent with all M12 and M18 cordless lights, the RADIUS SITE LIGHT/CHARGER is backed by a 5-yr tool warranty and limited lifetime LED warranty. Focused on improving productivity for professionals in the trades, MILWAUKEE offers more than 125 performance-driven solutions that are fully compatible with the M18 family — the fastest growing 18V cordless system on the market.